We take pride in providing affordable cleaning services that really work. 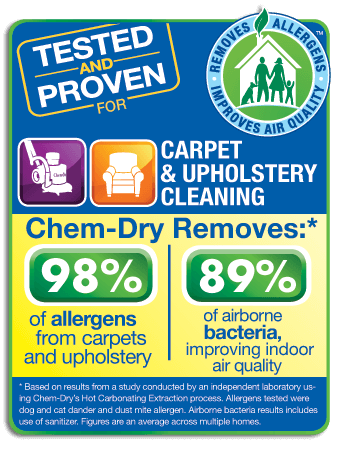 Using the patented Chem-Dry® equipment and solutions means that we clean deeper, but more gently – leaving your carpets dry in 1-2 hours, rather than the 1-2 days required by most carpet cleaning companies. We leave your carpets clean and fresh without soaking them with water and harsh chemicals. Most other cleaning methods force water down into your carpet fibers and padding, and though suction is used to remove the water, a large amount remains. This creates a breeding ground for mold, mildew and other bacteria that can be harmful to your home and family.